The iPhone 6 and iPhone 6 Plus are wonderful tools to capture photos on the go. You can even get better photos with them with an iPhone Ring Light. This is a handy device that helps you capture evenly-lit shots and videos. 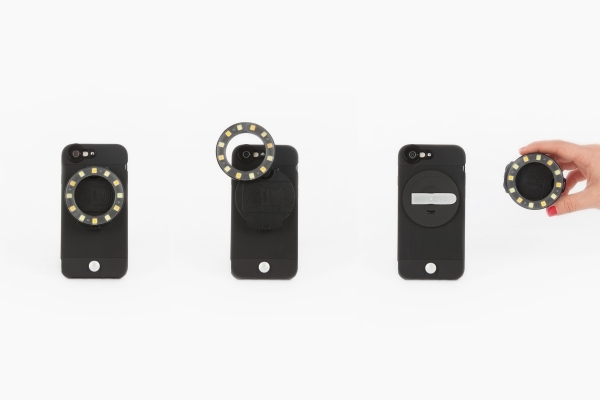 The Smartphone Ring Light is a case with a detachable ring light. That means you can pop the ring off for more challenging shots. Users get to adjust the light’s brightness and temperature using the dials on its side. The product is powered by 2 AAA batteries. The case is compatible with iPhone 6 or iPhone 6 Plus, but you can use the light with any phone. The Ring Light sets you back $55 at this time.